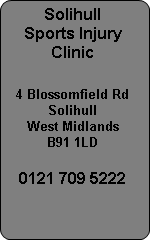 Sacroiliitis or inflamed sacroiliac joint syndrome can be treated in Solihull West Midlands at the Solihull Sports Injury Clinic. Often referred to as sacroiliac joint dysfunction or SIJD. Sacroiliac joint pain is generally one sided low back pain which can sometimes switch sides. Symptoms vary but can give groin pain, pain around the hip and buttock and even refer pain down towards the knee. On occasions men can experience testicle pain too! At Atlas we have developed a unique successful treatment for sacroiliac pain and it works in 99% of cases in no more than 6 visits. Osteopaths, Chiropractors, Physiotherapists or Acupuncturists do not use this treatment method because it was invented by John Williams of Atlas Pain Relief Centre and designed for use in his pain relief clinics. Typical symptoms described are, struggling to lift the leg enough to put on shoes and socks, pain when turning in bed or getting up from a seated position and swinging your legs in and out of a car. The pain can range from a dull ache to a sharp stabbing pain when moving in certain positions. If you experience these symptoms you may have sacroiliitis, it will not show on any scan and many orthopaedic consultants are at a loss to treat it. Injections will not treat this condition successfully so visit the experts and enjoy the success we offer.